A recent client of mine asked to have a testimonial system built for their WordPress website. Testimonials work great in converting visitors into valuable customers. People want to know the experience of other existing users before making any decision, and that’s where the embedded testimonial plays its role. Here, in our today’s post we have compiled a list of some of the amazing free WordPress testimonial plugins for your WordPress blogs. These free WordPress plugins allow you to display testimonials on your website or blog, and they come with great features. The testimonial plugin uses featured images, TinyMCE editor and 2 custom fields that provide a tagline, such as their company name, and a website URL. You may be interested in the following posts: Useful Free WordPress Grid Style Widgets, Photography Free Themes for WordPress, Political Premium WordPress Themes and Free WordPress Plugins for Photography. Display beautiful testimonials on your website that evoke your customer’s trust, made easy with Handsome Testimonials. Social Proof is one of six principles of Influence. People are particularly susceptible to it when they’re feeling uncertain about a company or brand. For instance, when they’ve landed on your website for the first time or when they’re on the fence of buying or not. This is where testimonials do their job. Recommend Us empowers you to easily capture client recommendations for your business, website and display them on your WordPress page or post. Showcase your existing content in a rotating slider or multi-image carousel that fits the user’s display. Easily customizable, supporting default and custom post types with or without images. Use a shortcode or widget to display your content. Resizes based on the user’s device, supporting touch navigation for phones and tablets. 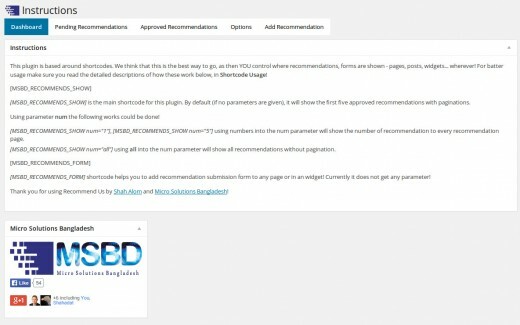 GS Testimonial Slider is a WordPress plugin which create custom post type to add client’s testimonials / recommendations to display anywhere of your site using shortcode. GS Testimonial plugin is simple but flexible & powerful. Testimonial Basics is a full featured testimonial management plugin. Easily edit and approve testimonials in the admin panel. Optionally use schema/Google snippet markup. Customize text color and background color. Group testimonials for separate display. Testimonials plugin allows you to display random or selected testimonials, or text with images. Features 1 Admin interface to add, edit and manage testimonials 2 Capable of handling multiple widgets per page or post 3 Fields for source, testimonial, image, title, location, email, company and URL details 4 Filters to manipulate testimonials output. Spectoos testimonials lets you easily select your LinkedIn Recommendations and effortlessly collect socially-proofed testimonials and display them on your website. Showing a real person’s face which is linked to a genuine social profile means more credible testimonials that can be verified. The best rating system plugin for WordPress. Multi Rating allows visitors to rate a post based on multiple criteria and questions. Multuple rating criteria and questions using star ratings, select drop-down lists and radio buttons to choose answers from. Automatic placement settings to display the rating form and rating results on every post in different positions. Testimonial is pure html & css3 responsive Testimonial slider for wordpress. Very easy to use via shortcode anywhere. Features: Fully responsive and mobile ready, Unlimited Testimonial anywhere, Different Theme, Custom number of testimonial to query, Different Thumbnail Size selection, Background Image for Testimonial area, Testimonial by categories selection, Quesry testimonial by ID, Font size & Color for slider items and more. Best Responsive Testimonials slider. Testimonials Slider is a WordPress plugin which is inspired from a bxslider. display testimonials for your blog, product or service. Automatically rotate testimonials in your sidebar. create a list of testimonials page. This is without doubt the best testimonial plugin for WordPress, it is simple but powerful and flexible. Rich Reviews empowers you to easily capture user reviews for your business, website, or individual products/pages and display them on your WordPress page or post. With Google Places, Google Plus and Google Local emphasizing the importance of Testimonials. Reviews are becoming integral for the success of any product or service online. The easiest to use Testimonial plugin! Showcase your testimonials in a beautiful and modern way with Sola Testimonials. Five layouts to choose from: single coloumn, two columns, three columns, four columns and a blank layout. Add custom CSS to create your own testimonial styles and themes. All testimonial links are nofollow as per Google Webmaster Guidelines.